Your boss is a person who duly respected in your workplace. But sometimes a Boss is impressed fierce for his employees, small things could be a mistake and a small mistake could be fatal. If you as his men are unable to show good things or not meet his target, and unable to adapt to the existing environment, then surely you will not feel comfort with such working conditions. Facing grumpy Boss need tremendous attitude, therefore you need to know some useful things to address grumpy boss. Facing grumpy boss, that you don't get yelled at, you need doing simple act, namely, doing every your job well which indicate that you are professional in your field to work optimally. Thus, you will automatically move to take the initiative and be proactive in achieving the feat. It could becomes your weapon to lure your boss. This Achievement will makes you keep staying in the company even makes you more evolved. When your boss is grumpy, you have to keep calm. Hold your emotions and try to react wisely. If you are being scolded by your boss, don't fall and addressing the issue with emotion. The better thing to do is doing good and well-planned approach. Thus you will be much easier when facing your boss. When you're talking, pay attention to your tone of voice, don't incur the impression that you're judging your boss. If you want to express a statement, don't let you express thing you can't account for. In addition, never discuss matters of personal nature with your boss. Show that you are smart in communicating and working, so your boss will certainly appreciate you. Conflict is a major factor that could stretch the relationship, including in the professional life. 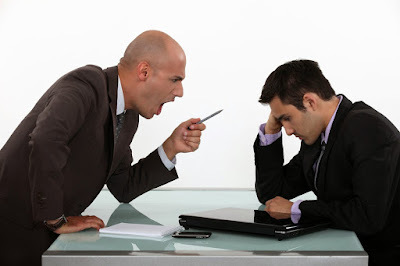 So never create conflict in your work environment, especially if the conflict between you and your boss, which also includes the attitude of those who violate the rules. Never talk negative things aboutyour boss in front of your colleagues, so it's better to avoid conflict and remain polite and peaceful in your work environment.